Music is changing rapidly. Sub-genres are added daily. Different Genres are merging into brand new things. This is a great time for artists willing to push the envelope and experiment with new sounds. Discovering the band Make My Blood Dance confirms that these bands exist and new original music will continue to come to our ears. The Brooklyn based band is just getting started but has been raising some eyebrows with their Disco-Metal sound. Think The BeeGees meet Rammstein. Quite a unique sound that demands attention. Fronted by powerhouse vocalist/frontman Evan Russell Saffer (Fixer, ERS, RainMKERS) and the guru of technical/witch of the west/guitarist/programmer John Polimeni (Proxima Control) Make My Blood Dance started taking shape in late 2017. They eventually brought in Alex “Mother Russia” Nikitin (Bass) and finally landed Carlos “CK1” Gordillo (Drums) after hiring several fill-in drummers along the way. Now they are ready to dominate an independent music lovers yearning for new sounds. The band just dropped their official debut single “Beaming Right Up”. The high-octane hit features powerhouse vocals laced melodically through their signature disco metal groove with masterful guitar work. The vibe is Saturday night fever meets Guitar Hero 2099. This is energy personified. Right behind this one are five more singles set to be released by MMBD. Heavy industry hitters were brought in to flesh out the full sound. The music was mixed by Dave Ogilvie (Tool, Marilyn Manson, Rob Zombie), produced by Kallie Marie (Explosives For Her Majesty, rainMKERS), and recorded and engineered with Paul Ritchie (Parlor Mob). 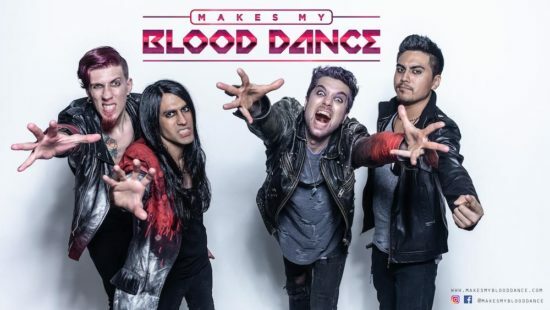 Make My Blood Dance has plenty more in store for the fans with further live performances and their first music video. To stay unique they will release limited edition USB Dog Tags which contain all 6 songs/bonus material/lyrics/album artwork, and more! Keep an ear open and ready.